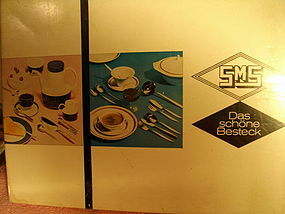 Box set of Sarosil pattern serving flatware from SMS in Germany. 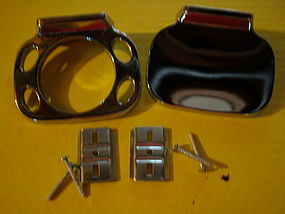 18/8 stainless steel, new condition in original box. From NuTone, for your mid century bath, a chrome polished toothbrush and soap holder, Metropolitan series. Unused, in excellent condition. 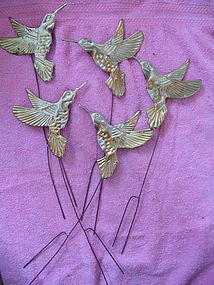 Five vintage brass hummingbirds can float atop your plants, or use them in your floral arrangements, has 4 1/2" prongs. Just over 12" in length, a few bend marks and small oxidation spots here and there. 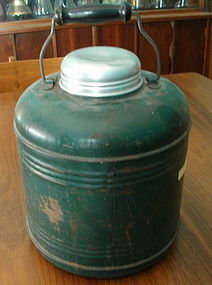 Call it a picnic cooler, water cooler, or thermos; a steel water cooler with ceramic liner, they were carried daily by a lot of men who worked at labor jobs. This old boy is in decent shape for the age, suffering some paint loss and a dent in the lid, ceramic liner has a hairline fracture. Great for display or use. 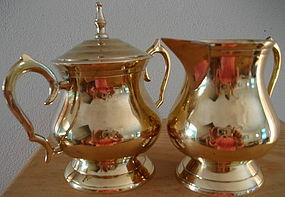 This is a very nice cream and sugar tea set in polished brass with nickel inside. Made in India, age or name of the pattern is unknown. Set is about 3 3/4" high. This set is polished and ready for use. 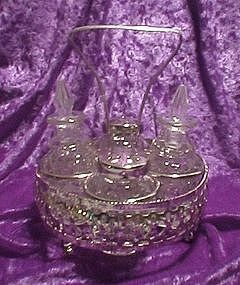 This is a very nice cruet set, 2 glass cruets with plastic stoppers, salt and pepper shaker in a chrome caddy. Great condition. 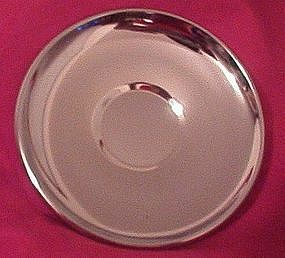 Kromex saucer, 6 1/2 inches in diameter. I'm not sure if this is indeed a "saucer" or a tray for something to sit on. No dings, great condition. 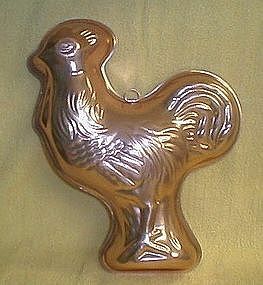 Copper color chicken mold, looks to be fairly new. Holds 3 1/2 cups, has tab for wall hanging. Good condition, no dents. 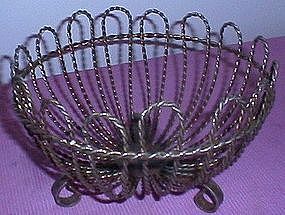 Vintage wire bowl, approx 8 1/4" diameter, 5" tall, great vintage piece for your table. 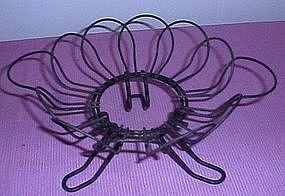 Vingage twisted heavy guage wire basket, scroll feet, very retro! 5 1/2" tall, just under 9" diameter. Looks similar to brass but I don't believe it is. It is also heavy for its composition. 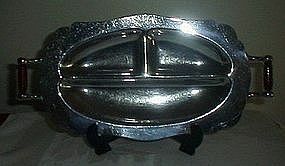 Continental Silver Co. Chrome Three Part Relish Tray with bakelite handles, marked on bottom with #3737. It measures about 13 1/2" long and 7" wide. This guy was a rescue. He has a couple scratches and the chrome is lightly pitted. Still a nice piece. 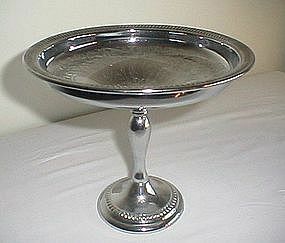 Great condition describes this chrome compote. Stands 6 1/2" high and about 7 1/4" diameter. Has a floral and scroll motif with ribbing around the rim and on the foot. Brass spoon with Montreal in the bowl. Twisted handle with a man pointing the way on the end. 5" long. Light tarnish. 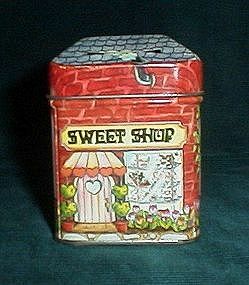 Enesco Sweet Shop Tin, has slot on top for your coins. Great shape, about 2 3/4" wide by 3 1/2 tall. 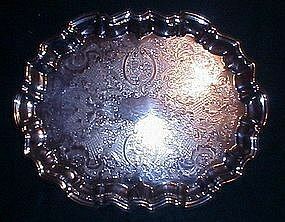 Great brass tray, unknown maker. About 10" in diameter. It has some spotting that remained after polishing. 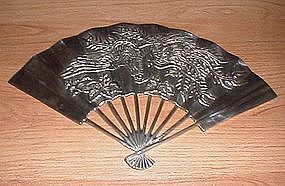 Beautiful brass fan, hangs on the wall, has a dragon or peacock design. About 11 1/2 by 7". Heavy for the size, great condition. 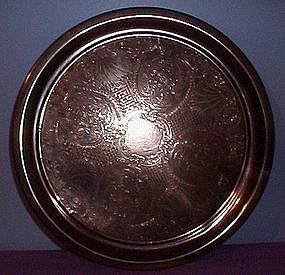 Copper color tray, 12" diameter. Has light wear. Seashells and floral scroll design. 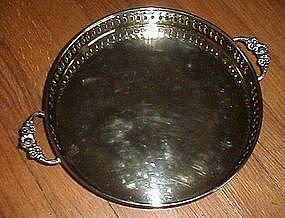 Silver Plate footed tray, about 14 1/2 by 11. Unknown maker, light wear. Beautiful piece!